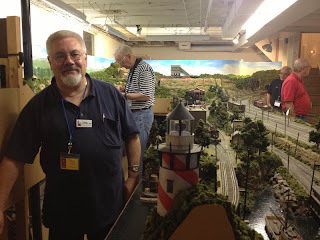 On Wednesday I drove to Northwest New Jersey to attend ProRail 2013. ProRail is a group of layout owners that focus on prototypical operations. They hold an annual get together at varying cities to operate layouts. It started with Chicago and Kansas City and has spread to other US cities. There are many such groups in the US and Canada. They spread by word of mouth. Chances are if you have a serious operating layout, you know of this or some other round-robin operating group. For Prorail 2013 I operated on Tom Piccirillo's O scale Somerset County Traction Company, Harold Wertheim's HO Scale Erie, Perry Squire's HO Scale Pittsburg, Shawmut and Northern and had a brief run on John Rodger's On2 Sandy River and Rangely Lakes RR. All of these layouts are basement filling empires with exquisite scenery, good running trains and interesting operations. A special shout out to Perry Squire's PS&N layout which ran flawlessly with excellent sound. It is especially amazing given that he runs tiny 1920s era steam engines. For example, check out this video clip of a 0-6-0 operating in St Mary's yard on his layout. Tom's layout also ran extremely well utilizing overhead catenary wire for power! Here is a link with more info on Tom's layout. This layout is also complete, an amazing accomplishment given the size and detail he has included. Tom stands near the ferry terminal at Lambertville. Harold Wertheim's layout has been featured in several national magazines. It is a vast layout spanning multiple levels and rooms. It absorbed 20 plus operators with no trouble. A highlight of this visit was a chance to chat with Harold. He is now 91 years old and doing great. Keep it up! project and he has made amazing progress. His layout features a fine collection of brass On2 engines and cars as well as a standard gauge Maine Central RR that interchanges with the SR&RLs. Like most O-scalers John has a complete metal shop with lathe and milling machines. Tom Piccirillo has an even more extensive shop, but that is somewhat to be expected as he is the President of Micro-Mark, a hobby tool specialist company. I guess you can't be an O Scaler without a metal shop. One of the best parts of a weekend like this is the socializing that occurs in the hotel and over meals. It was great to catch up with many friends. It is amazing how friendly and generous model railroaders can be. I was especially gratified to hear many people say they enjoy this blog. If you are a regular reader, please join the list of followers and don't be shy to comment. 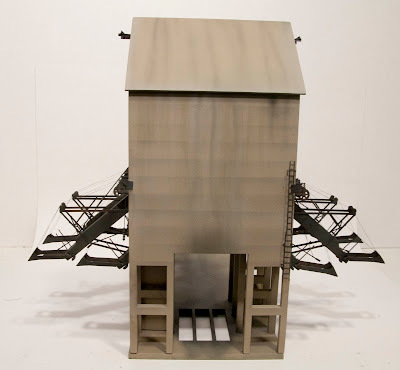 I delivered the coal dock model to Ted Pamperin. He was very happy with it. Several others commented on how much they liked it and I got orders for a couple more. Finally thanks to all the hosts and helpers for running a great weekend. My Prorail weekend was bookended by visitors to my layout. On Tuesday, Milt Martin from Austin, TX, and my brother Rob visited the layout. Milt is not a model railroader, as he enjoys car restoring and collecting guns. He had a chance to try the layout. He said he may try some model trains after the visit. Lets hope we have a new convert. Marshall with Whiton pushing cars on the nose. On Sunday, Marshall Stull from Michigan visited. He is building a small HO Scale layout depicting Illinois Central in the Mound City, IL area. You can find more about it here. I gave Marshall a switch list asked had him do an op session on the Road Show. He spent about 45 minutes working the layout. He used the front draw bar on the engine to do some switching as he started where Chuck, Keith and Jack left off last Monday and the engine was facing east with a cut of cars behind. I did not tell Marshall about the rule regarding the front coupler bar, so he went ahead and used it. It worked well. It tends to have trouble on tight curves, or long cuts of cars, but on this layout works pretty well. Overall the road show layout worked well, though we noted that the engine derailed on the west crossover. This is the second instance of a derailment there. In examining it we concluded that the guard rail to the frog was not long enough. I added a section of guard rail to extend it and it worked flawlessly after that. This evening Paul Dolkos, John King, Chuck Hitchcock, Keith Jordan and Jack Ozanich visited the layout. They are in town for ProRail 2013. The actual ProRail is taking place in New Jersey next weekend, but a few folks came to Washington for preliminary operation sessions on some of our local layouts. I will be heading to NJ on Wednesday to participate too. All the visitors but Jack Ozanich had been here before. It was Chuck Hitchcock's suggestion to use the magnetic pins in the couplers way back in April 2010. All these men have extensive model railroads, most are nationally, perhaps internationally known. Keith and Jack actually have two. Keith has a website for one of his layouts, the Patch, here/ The Patch is similar in scope to our Civil War RR Road Show. Jack has a wonderful HO layout in his basement, and a magnificent live steam railroad outside on his fifty acre wooded lot. The photos at the left, which I took in 2003, show some scenes on his outdoor layout. The round house is fully operational with elevated tracks for maintenance on the locos. Jack has operating sessions on his outdoor layout where they use the railroad to haul fire wood to the house for heat. Jack is a retired railroad locomotive engineer. He is also a civil war history enthusiast. The turntable is fully operational, as are the engine house stalls. Back in Virginia - After watching an introductory video on the Aquia line and a layout tour, I put them to work operating the Road Show Layout. I had made up some paperwork earlier and pre-staged a five car train on Biscuit Run. The paperwork is based on actual USMRR documents. The first paperwork used on the layout. We'll save it for prosperity. Chuck took over as conductor, with Keith as the engineer, and Jack as the brakeman. The three man crew worked quite well. The paper work was new to Chuck and it took him some time to get used to it. By acting as conductor he was able to study and concentrate on the paperwork and decide how to do the switching. I made the switch problem a little harder as they had some sorting to do and had to do a facing point pick up. To set the stage, I provided some telegraph messages that annulled the schedule and told them to run extra from Biscuit Run to Columbus Landing. The schedule was annulled due to notional enemy activity cutting a bridge further down the line. But the switching problem will be more interesting if we have scheduled trains to consider while working the terminal. Jack did a great job as brakemen with the link and pins. He got the hang of it right away. The Stanton throttle is a little quirky, but Keith got used to it quickly. After about 15 minutes they were operating like the real pros they are. It was very entertaining for Paul, John and I to watch them work. All in all a good session. The layout provided these very experienced operators about 30 minutes of fun. It bodes well for future op session on the road show. A few other lessons learned from this session. The operators really need to reach into the layout to work the link and pin couplers. So it will not be a good idea to put delicate models between them and the tracks. The steamboat comes immediately to mind. 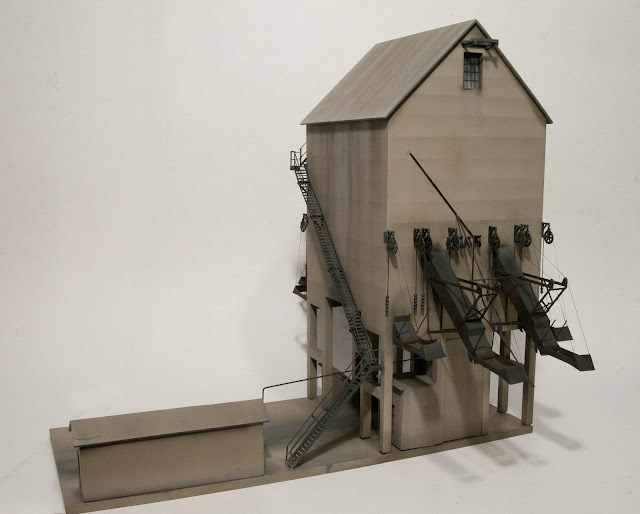 If we do add the steamboat, it should be removable for operation sessions. A low lying barge may be a better model for that reason. Before the session, we should give the operators a short lesson on how to use the various items. The link and pins, throttle, switch stands and even the paperwork are very different from what most model railroad operators are used to. Perhaps a short video might be a good way to avoid us having to say the same thing over and over as visitors try the layout. The three man crew worked well, but a two man crew could also work. Since you need two hands to do the link and pins, you need a place to put the paperwork, if you will be conductor and brakeman. The engineer should probably not take a second task. So a minimum crew will be an engineer and conductor/brakeman. This type of classic work bench is still used by carpenters. Alkem Scale models has released the O scale carpenter tool set as a stand alone kit. We developed this kit for this Civil War layout, but these tools can be used in any carpenter's tool box from the 19th century until today. They are perfect for detailing any wood shop scene. See the new Alkem Scale Models web site here for more pictures and details. For you can order them direct from this blog by clicking the Paypal shopping cart below. The hanging rack is included in the tool kit. The kit includes 3 hammers, 2 hand axes, 4 spoke shaves, 1 shave horse, 2 bow saws, 5 hand saws, 6 clamps, 2 tongs, 8 chisels, 2 dividers, 3 try squares, 2 drill braces, 1 tool box, 1 work bench, 1 set of shelves, 1 tool rack, and 2 saw horses. Shed not included. 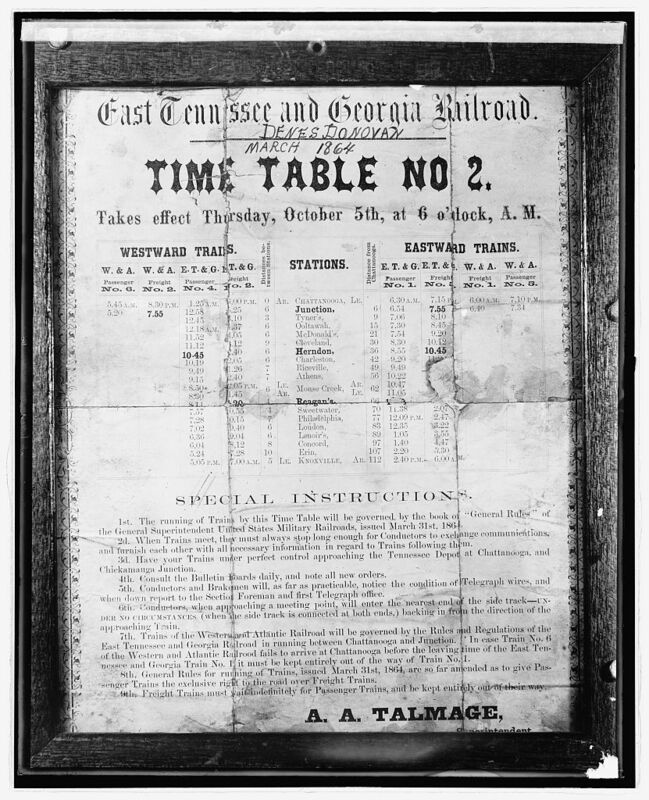 I recently found this image of a time table for the USMRR operated section of the East Tennesse and Georgia Railroad. There is a lot of information contained on this image and it is worth studying. Note the Western and Atlantic trains listed on the timetable. The Special instructions are very interesting. The link for the high resolution image is here. This week marks two milestones for the USMRR Aquia Lines. First, the beginning of April marks the 150th anniversary of the completion of the arched truss bridge at Potomac Creek. I don't know the exact date, so this will do. Also, this weekend the blog saw it's 500,000 page view. Thanks to all those that visited. I hope you found it worth while. Let's try for another half million. 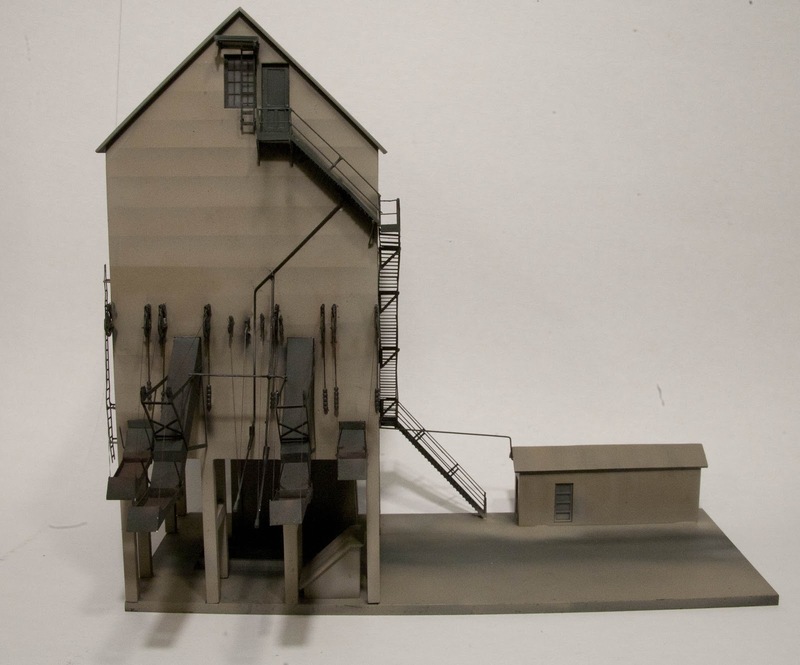 I finished the pilot model of the Thurmond Coal Dock in HO Scale. Actually, that is not true, I still need to add the Fairbanks Morse sign and a wooden small shed on the trackside, but otherwise it is done. I have not decided if I will sell this as a kit. There is still a fair amount of work to go from the pilot model stage to a sellable kit. The instruction book is probably as much work as developing the kit. We will see what kind of demand there is from C&O modelers. This pilot model will go to a client in who is modeling the C&O New River Subdivision in the steam era. The Fairbanks Morse sign will be added to this wall. But bull oxen are ok. I assembled and painted two 40mm scale oxen from Trident Designs. They are nice castings and they painted up pretty easily using primarily my airbrush. 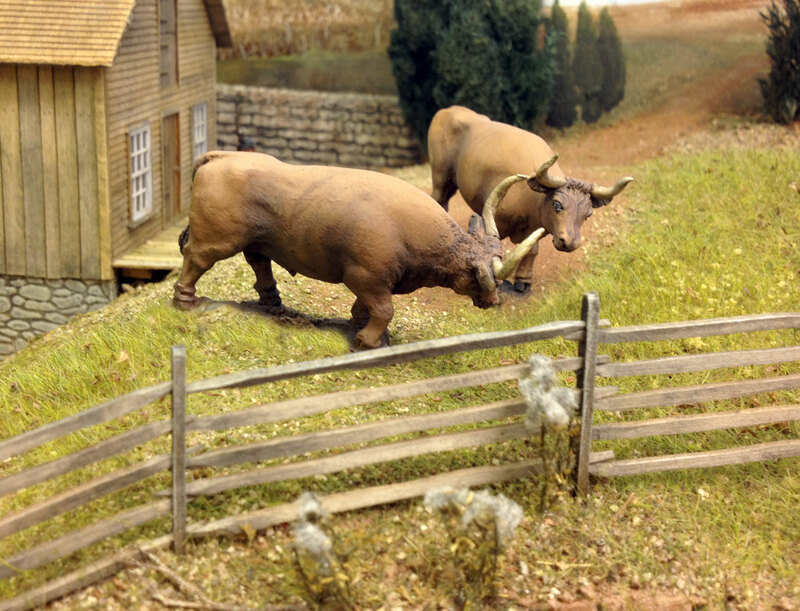 They work out to be fairly large oxen in 1/48th scale. These, along with a few others, are destined to pull a heavy wagon on the layout, but for now they are cavorting in the paddock near the water mill. I've been using my airbrush and Vallejo paints a lot lately. I had been thinking about getting them better organized. So today I made two racks to hold them. I laser cut 1/8th inch plywood for most of the parts and glued them with yellow glue. I used some strip wood to stiffen the rack. The bottles fit snug, so I can pick up the racks and move them when I need them without the paints falling out. One rack holds airbrush paint, while the other hold brush paints. While the two projects above were fun, the majority of my modeling time this weekend was spent building a pilot model of HO Scale coal dock based on the prototype at Thurmond, WV. I am evaluating whether this should be a kit. This image shows it with all the photo etch parts assembled. Still a few more parts to add, then paint. The B&O Railroad Museum had a ceremony today to officially open the third year of their five-year exhibition on the Civil War called "The War Came by Train." Courtney Wilson, the Executive Director of the B&O Railroad Museum, mentioned that interest in the civil war and this exhibit has lead to a resurgence in interest in the museum. They get more than a quarter million visitors a year. This year the museum jointly celebrated with the state of West Virginia, which is also celebrating its Sesquicentennial - 150th Anniversary of Statehood. Several officials from West Virginia were on hand for the ceremony. Dan Toomey and Richard Wolfe gave brief speeches about the significance of the B&O in the formation of the state of West Virginia. Here were some interesting facts they mentioned. The reverse side of the West Virginia state seal has an image of a B&O Railroad train. The first Union soldier killed in action by a Confederate soldier happened in what is now West Virginia at a fight over a bridge on the B&O. The eastern panhandle of West Virginia, the part of the state that gives it such a distinctive shape, was a result of the Union government wanting to keep the B&O RR in the new state of West Virginia and out of the rebelling state of Virginia. Whether West Virginia could remain a state was disputed by Virginia after the war and was settled by the US Supreme Court. The West Virginia folks brought along representatives from several gourmet shops and business in West Virginia with samples of their food and beverages. In the gallery the rail gun models I built for the museum and the ones I loaned were on display. If you visit the museum, which I recommend, please give them a look. The caption on the card is incorrect- this is a 1:32nd scale model on loan. Last week JB volunteered to work on the post office building. On Saturday he sent me a note describing a little problem he had. In attempting to correct a warp in the plastic kit, he warmed the part in an oven set at 250 degrees. That was too warm and the plastic kit wall warped and distorted. It was too bad, as he did a nice job on the cornice and side walls. So that evening and the next, I had some time to make a new post office. Since this one was not starting from a kit, I was able to copy more of the features of the Cairo Post Office that is the inspiration for this model. I laser cut the plywood core. Then I added O scale plastic brick. I used Tichy windows for the upper story, but all the others were laser cut. The first level doors are several layers of laser cut parts. 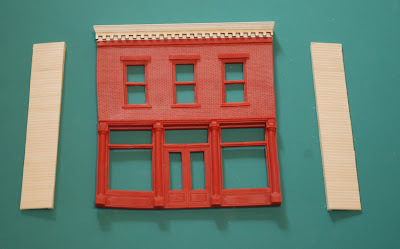 The crown molding for the cornice was a piece of molding left over from my daughter's doll house construction. The post office sign is a custom made decal to match the prototype sign. The lettering had to be done one at a time as there was no matching font. To detail the interior, I added a photo of a 19th century post office on display at the post office museum. So that completes the post office except for the board walk it sits on. With post office and depot ready to be installed (I still need to add chimneys to the depot), I took a crack at installing a piece of backdrop. This backdrop scene is more of Brian Kammerer's artwork. The street at an angle works nicely in this spot. So far so good. extend the brick wall, add a tree or leave alone? Any ideaS?